When we left on this trip, I knew next to nothing about Guatemala. I take that back. 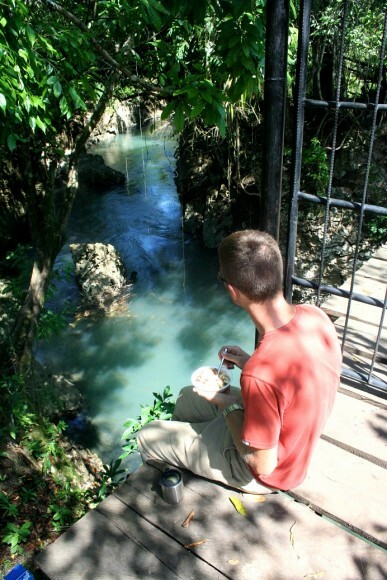 When we left on this trip I knew absolutely nothing about Guatemala. It should thus come as no surprise that we found ourselves in this predicament. 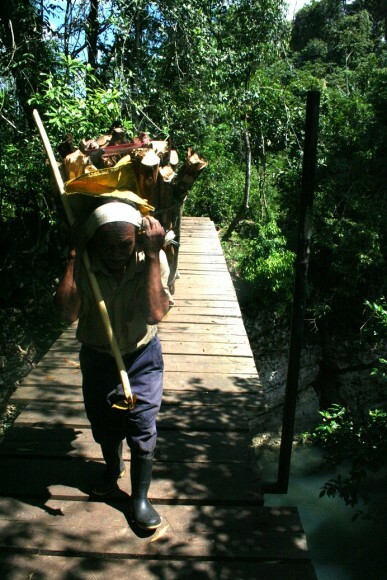 You may recall that our original plan was to drive from Tikal to Semuc Champey in one day. We ended up camping out in the schoolyard of a Mayan village in the middle of nowhere after the main highway on our map turned out to be a really rough, really long dirt road. We spent the evening surrounded by dozens of Mayan children staring at us while we sat in Nacho, staring back. The next day, you will recall, we barely managed to get off of the terrible dirt road before our wheel bearing failed, leaving us stuck in a podunk town for five days. A demoralizing affair, you will recall. By the time Nacho was ready to go, we had talked ourselves out of going to Semuc Champey, as we were told that the road to get there was 3-4 hours of hellish, rocky, Nacho-killing steep dirt roads. It sounded like a surefire way to destroy more wheel bearings, so we opted to scoot on a mere 155 miles to the mountain town of Nebaj. Only three and a half hours away, Google Maps said. 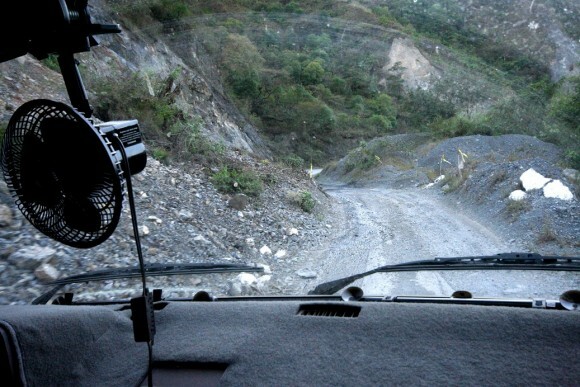 What we didn’t expect was to drive from Fray Bartolome to Coban, a distance of 80 miles, in first and second gear. But mostly first gear. The road was never flat; it oscillated between straight up and straight down. While climbing, Nacho insisted on being in first gear. While descending, Nacho’s brakes insisted in being in first gear too. After our early morning departure, we arrived in Coban, the halfway point, in time for a late lunch. We would have been faster, of course, had we not taken the time to stop for breakfast next to a river, and to give a firewood-carrying old man a ride. We’re supposed to be enjoying ourselves, right? And doing charitable things for the elderly? At Coban, the capital of the department of Alta Verapaz, we were sure our luck would change. We were turning onto a new highway, the CA14, followed shortly by Highway 7W. They were big thick red lines on our map, ensuring fast-moving smooth travels. Minutes later we realized that we were wrong again. We reminded ourselves how little we knew about Guatemala. Mountains? All of it? When we hit the 7W it didn’t take long to turn to dirt. We had traveled 95 miles by this point and had not managed to move beyond 2nd gear. When the road turned to dirt we slowly crawled over a few off-camber deep ruts studded by sharp rocks before we stopped and looked at each other. “Are you kidding me? Is there some other way we can go?” I asked. It didn’t look promising. The next place of interest for us was Lago de Atitlan, which would put us nearly out of the country after a really long detour. We couldn’t keep skipping sites because of the roads. We reluctantly drove on. After a couple of hours of slow, first gear crawling, we came to a split in the road. Straight ahead the path was full of tall weeds and it seemed to head straight for a cliff. To the left the road pitched straight down at what seemed to be a 35 degree slope, at least. If we drove down, there was no way we’d get back up. The road clung to the side of a steep vein of rock jutting off of the mountain before plunging off the end and around a corner at an even steeper pitch. A man had parked his bicycle and was urinating in the middle of the weed-patch road. We felt uneasy. 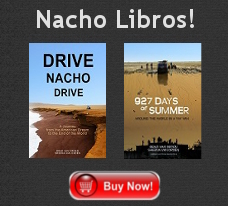 I tapped the gas and sent Nacho sliding down the loose, dusty incline straight down the side of the mountain. By the time we reached the second or third corner, maybe three hundred yards down the road, I pulled onto the embankment to let the brakes cool down. If I didn’t keep it at a walking pace, then our tires would slip under braking. As we sat on the roadside the urinating bicycle man slowly rode past us, his rear wheel locked, skidding. Sheena got out and walked the next corner. Safety first. We alternated between driving and letting the brakes cool for what seemed like an eternity. The road kept switching back, diving lower and lower down the side of the mountain. Suddenly, as we came around another vein of rock jutting out of the mountain, our jaws dropped. The entire face of the mountain in front of us had peeled off and slid down into the valley below. All that was left was an enormous scar where a mountain used to be. The road wound its way right through the middle of the landslide, weaving through rocks the size of buildings, clinging precariously to the side of the rubble-strewn slide path. Where the road had split, before the steep downhill, we had turned onto a makeshift road where the old road had apparently been wiped off the side of the mountain. We slowly creeped along through the rubble, crossing a stream that continued to erode away the mountainside. 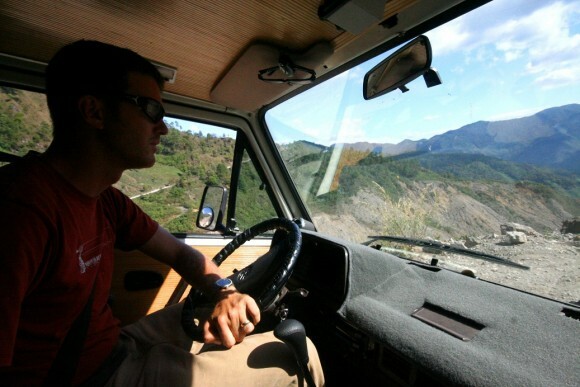 As soon as we made it across the landslide, the road pitched straight up. We would have to climb all the way back up to where we started, but on the other side of the slide. Due to the steepness of the road, there were times that we would bog down in first gear and it didn’t seem like we’d make it. Nacho is big boned and doesn’t like hefting his 5,800 pound body up really steep stuff. In these cases, just as it seemed we’d stall, I would push in the clutch, rev the engine, and release. It’s a great way to destroy a clutch, but given the alternative, it seemed right. It was that or face the wrath of a raging wife. What do you mean we’re STUCK? And in DANGER?! In the end, we made it to the top, albeit just barely. 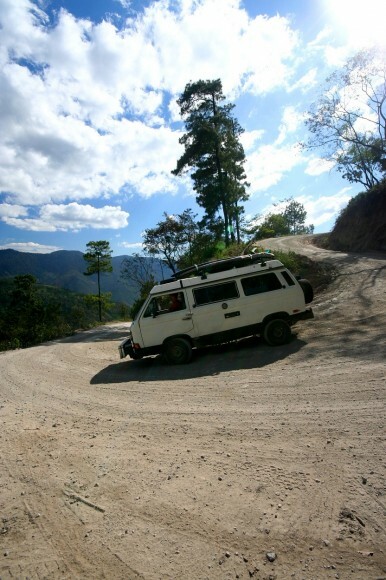 Renowned for its incredible views, highway 7W was until recently the most direct route from Huehuetenango to Coban. But in late 2008, disaster struck when a mountain collapsed atop the road, leaving its east end in shambles. There’s been no official attempt at rebuilding, but locals have carved out a hastily constructed detour that’s generally considered unsafe. 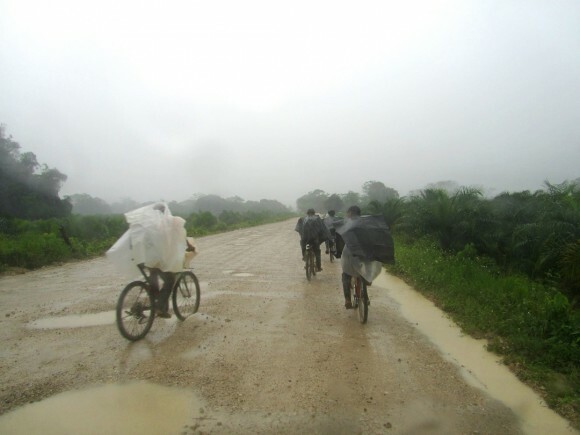 Buses from Uspantan to Coban regularly plow through the debris anyway, despite the dangers. By all accounts, it’s a hair-raising journey and things worsen when it rains and drivers refuse to risk the gap, making passengers hike through the mud for 2km to continue the journey. The saner alternative is backtracking via Guatemala City, a loss of about 4 hours, but an infinite gain in peace of mind. After a couple more hours we finally reached pavement again. For the first time, after eight hours of driving, I put Nacho in third gear. A few seconds later we came across another landslide covering the pavement, so we put it back in first and felt our way through it. First, second, third, landslide, repeat. As we approached the high mountain town of Nebaj, night had closed in on us. We wound our way up into the mountains in first gear, 15 miles per hour, ever higher into the night sky. As we traversed one switchback after another, we looked out the window at the twinkling lights overhead. In the deep black of the night we couldn’t tell if we were looking at stars, or at the lights from homes clinging to the mountainsides above us. By nine o’clock we pulled into the small Mayan town of Nebaj; headquarters of the rebel army during the country’s recent civil war, chosen for its natural defenses against enemy attack. The trip of 155 miles took us 11 hours. An average speed of 14mph. Screw you, Google Maps. In Nebaj we admired the traditional dress of the local Mayans, shopped in the local market, and hiked through a mountain pass to the even smaller and more remote town of Acul. In the mountains we took pity on the hordes of children emerging from the dense forest with loads of firewood on their backs. We awoke each morning to the smell of pine burning in wood stoves and admired the blue skies and vast mountainscapes. On the morning of our third day we pointed Nacho skyward, climbing the mountain rim surrounding Nebaj. Once at the rim we pointed Nacho downward, into the switchbacks. From Nebaj to Lago de Atitlan we continued our slow progress across Guatemala, in first and second gear, at somewhere around 15 miles per hour. You guys are writing quite a tale! Happy travels…. 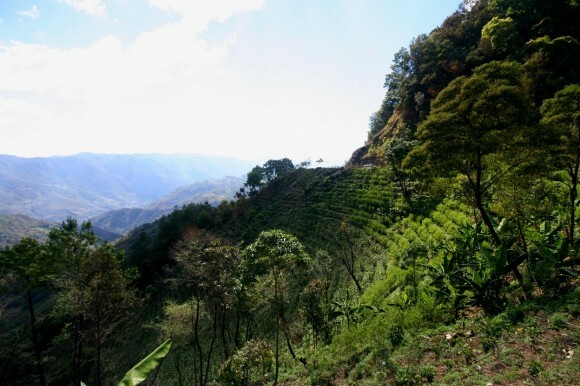 Guatemala is a living landscape, that’s for sure. Congratulations for surviving the adventure on that road. That drive will give you much better memories than you would have had if it were all pavement! Enjoy Lake Atitlan. I have spent time in Santiago de Atitlan and the people there are a joy. Say “hola” a Maximon! Rob, we’ve created a formula for using Google Maps to judge driving time, and have validated it using empirical data. Actual time = Google time x 2. It usually works pretty accurately, although in Guatemala it was more like x 3. We’ve also found that when we ask locals how long something will take, they’re talking about driving like a maniac. If they say 3 hours, it’s 5. Hope you guys make it (have made it?) to Lago Atitlan after everything you’ve endured – it’s *absolutely* worth it. We just spent a week there and it blew our minds. We also fell prey to (only one) landslide, and spent six hours sitting in a mile-long traffic jam before they let us through. On the way back, the driver drove as close to the landslide as possible, got out and walked around the landslide with us, then got us on a local “chicken bus” to the border. fun stuff! 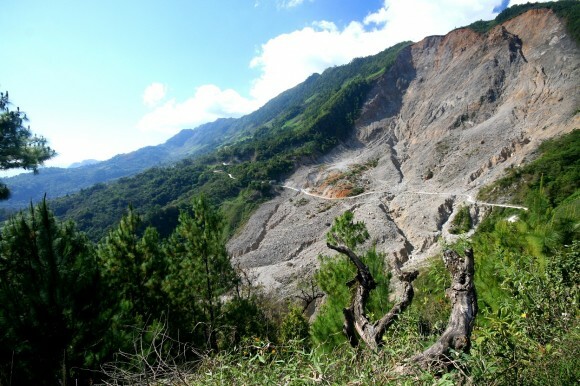 there are never warnings on either side of the landslides – as far as we know, it’s just always been there. love the stories, as always – stay safe! Great stuff and full of suspense. Man, it is easy to appreciate why you nicknamed old FA-Vey, Nacho.! !.She definitely has your well being in its lap. To come to think of it, there is much in common with your adventure.. Please forgive my taking liberties but I do wish you safe and happy travels. P.S. If and when you get to Africa, especially East Africa and you ask a local how far a certain place is, the answer will inevitably be ” Just round the corner . Not too far. A few miles only. This will normally mean a minimum of 2 hours and more. Of course, in my time, Google maps would have been a subject of incredible imagination or a fantasy of infinite proportions. See how lucky you are?? We love reading your blog. Really good descriptions of food , places, people and situations. Sorry that you missed Semuc Champey. It’s a special place. If your not past it yet, Chichicastenango has a good weekly market that’s worth seeing. 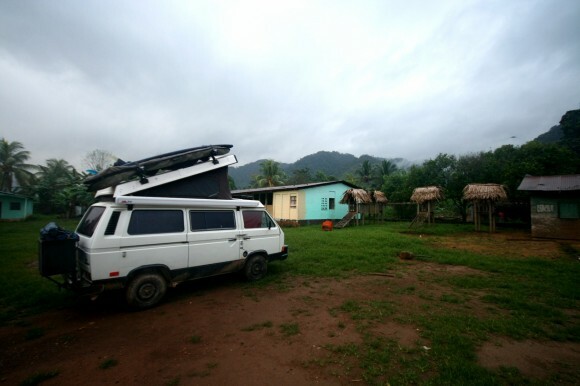 When we drove the 7W in 2007 it took us more than half a day to drive only from Cobán to Uspantán, so well done! But what a shame: at the time the second half of the road was newly constructed smooth asphalt (still w/o markings), only just finished; sounds like now it’s all gone due to a land slide. “…we admired the traditional dress of the local Mayans…” Funny, that guy in the pic is wearing a Ferrari F1 team shirt! LOL. Keep up the bog posts as they are most entertaining! @Unibagel: That’s a good observation. In every Mayan village we went to the women wore traditional dress, but the men dressed in modern clothes. Kind of a double standard, as the women are unable to dress how they wish because people in their villages will consider them wild and rebellious (according to someone we asked about this). We only found one village where the men dressed up as well. @Bob & Karen: Nice to hear from you! We were unaware that you were following our blog, but are glad! 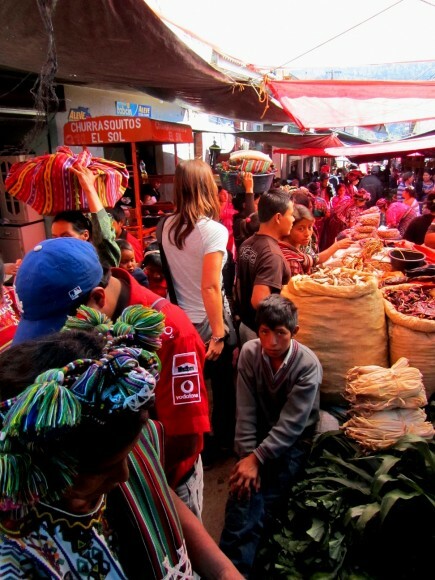 We did end up going to Chichecastenango for the market, but it happened to be on a day that I got sick. Therefore I stayed in the van and tried to sleep while Sheena took to the streets herself. She bought a few things, but the desperate vendors proved too overpowering for her and she quit early. If only we were there under better circumstances! Brad and Sheen, I am speechless. Now I have to go to bed and have all kinds of nightmares. I promise myself next time I read your blog it will be in the early part of the day. Stay safe of course. Bradley what a professional driver you are now. Sheena please don’t have a nervous breakdown just yet!!! Luv you both!!! Geo and Chelly are saying way to go Mom and Dad!!!! gracias……estamos atento a sus comentarios y aventura!!! !